Here is some feedback about my setup of a SSD disk in an old laptop, an IBM ThinkPad X31, more than 6 months after the initial setup. Although I wrote this article with a precise computer brand and model in mind, you should be able to apply it to other computer models, as the basis should remain the same. 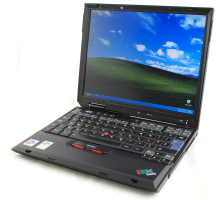 I'm the owner of a small ThinkPad X31, an old professional laptop from IBM, released in 2004. You'll find some archived reviews of this machine on some websites such as TrustedReviews or DevHardware Computer Systems Articles. This computer is still in excellent condition as of today, but was indeed painfully slow to use because of its factory hard disk drive, spinning at 4200 rpm, suffering from constant I/O operations. Being a spare laptop I only use in the kitchen to read recipes or watch TV, I didn't want to replace it with a netbook or tablet. Besides the price tag of these devices in mid-2013 (around 200 € for a good tablet with its dock, or 320 € for a newer netbook like the Acer Aspire 756), I was concerned about losing its rock-solid building quality for a cheaper-built device. So, I decided to replace the slow factory hard disk drive. 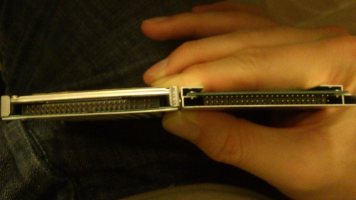 The only problem being that the X31 only came with a single, 44-pin Parallel ATA (PATA/IDE) port, which was still common as of 2004 - the SATA standard was just entering the market back then, not to mention laptops. It was thus extremely complicated, back in 2013, to find a good IDE laptop drive at a reasonable price, even more if you consider that I actually needed a fast drive to gain a real change from the old factory drive. 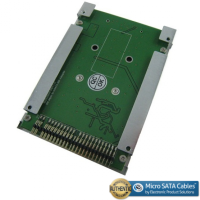 either a SATA to IDE adapter, to put a SSD right into it, and avoid any problem related to a classic Windows OS; despite the higher price tag. I chose the second option, more reliable and future-proof. 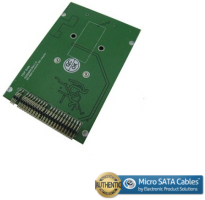 Don't be confused by many websites which keep confusing mSATA and microSATA! They come with different connectors, pictured by the following product. Be careful when buying your adapter! I chose mSATA, the most widespread mini-SSD format, after checking that both size and thickness of the SSD adapter with disk would fit into the IBM ThinkPad X31. 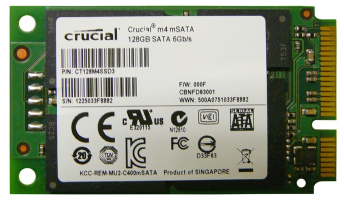 I picked up a mSATA Crucial m4 128 GB (CT128M4SSD3) SSD drive, this one having the best performance/price/reliability ratio among all mSATA drives as of early 2013 (99 € back in February with free shipping). The adapter is bundled with all necessary screws and operating manual. Mounting both SSD and adapter was rather simple, even if I had to mount them in reverse order compared to what's said in the manual, so that the adapter would sit flush in the X31's disk drive slot. Strange! More than installing the disk itself, I actually spent most of my time to find out how to copy the IBM Hidden Protected Area partition from the original drive to the SSD; it was the most tricky part. Copying this 5 GB partition was mandatory, as it holds all the maintenance tools offered by the blue "Access IBM" button, including the ability to restore Windows XP in a factory state (which may be handy). I first made a backup of the whole disk with the excellent Paragon Backup & Restore Free (which can backup all partitions from a single disk, boot sector included, to restore them on another disk, even with different size). The downside being that this software can't backup the hidden partition of IBM computers from this era. You have to use two utilities provided by IBM (fwbackup.exe and fwrestor.exe) to backup and restore the hidden partition from the factory drive. I could then restore the Windows partition from the original drive to the SSD thanks to the backup I made with Paragon Backup & Restore Free. I first wanted to split the contents of the new SSD in two separate partitions: 48 GB for the operating system, and 80 GB dedicated to data or software. But it seems that the hidden partition area of the IBM ThinkPad does not support partition split or resize with third-party tools such as EaseUS Partition Master. Each time I attempted to recreate an additional partition after the factory Windows partition (thanks to the additional 80 GB offered by the SSD), the hidden partition became corrupted, and I had to reformat the disk each time to restore it once more. I ended up with having a single 128 GB partition, instead of the initial 48 + 80 GB setup I targeted. Several months after installing this SSD, this little IBM became a rocket: less than 30 seconds between pushing the Power button, and the complete availability of the Windows XP desktop, compared to several minutes before. All applications appear instantly after being launched. The videos you'll find on YouTube are totally realistic. You must be aware of the fact that the ThinkPad X31 is indeed limited to Ultra-DMA/100 or ATA-6, which allows up to 100 MB/second transfer rate. 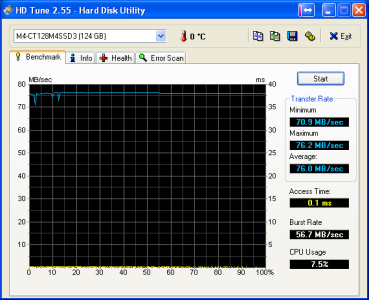 HD Tune shows transfer rates above 75 MB/sec, six months after installing the SSD into the laptop. We're indeed far away from the transfer rates we could hit thanks to the disk's SATA III compliance, but these transfer rates remain fully satisfactory, and without any possible comparison with a 7200 rpm mechanical drive, even among the very latest models released in 2008, like the Samsung HM160HC which was rated up to 68 MB/sec. Total costs and overall benefits from the operation? If you're still taking care of an old laptop for the same reasons, I can only recommend you to do such an upgrade, which will significantly boost it.